Are You On A Lookout For A Good Inverter? Nowadays, power cuts are so common that some alternative power source has become inevitable in every house. Inverters are devices which are designed to deliver an uninterrupted power supply. Every UPS consists of three basic units; the charger, the battery and the inverter. The functions are simple; the charger charges the battery when the normal power supply is available, the battery stores the charge, the inverter converts the stored direct current (DC) to alternating current (AC) whenever the actual power supply stops. ‘Having a good UPS in your house can solve all your power-cut related troubles,’ says the popular inverter dealers in Chennai. How to choose the right inverter for your house? Inverters are available readily in the market, but they are not something which should be bought randomly. There are few factors which you have to consider while buying an inverter. They are listed below. Is your home wiring done right? – Providing complete backup for your home can be easily done, but it requires a battery and inverter with huge capacity especially if the number of power points in your house is very large. And most often, you do not need a complete backup; power backup for selected points and appliances would be enough to meet your needs. To provide backup for selected appliances, plug points, etc. the wiring of your house has to be done accordingly. So before shopping for an inverter, you have to ensure that the wiring in your house supports the installation of an inverter. What is the power requirement for your house? – Once you make sure that the wiring is right, the next step is to calculate the power requirement for your house. The total power required depends on the number of appliances you want to be backed up. Calculate the power require of each device and then sum it up to get the total power requirement. What is the capacity of an inverter? – So, now you know the power requirement of your house; next, you must look for an inverter which has a capacity to deliver the power that is required. The unit of capacity of an inverter in Volt-Ampere (VA). You can get the Volt-Ampere rating by dividing the total power (which you obtained in the previous step) by the power factor of an inverter. An inverter which has a VA rating greater than the VA rating you need for your house is what you should look for. Another point to note here is that the battery capacity and the inverter capacity should also match with each other. The complete capacity of a battery cannot be utilised if the inverter capacity is lesser than battery capacity. What is the power quality which you prefer? – Every type of inverter does not deliver the same quality power. Based on the power quality they deliver, inverters are classified into two types. The first type whose output is an exact sine wave provide better power quality, and hence they are more expensive than the second type whose output is a sine wave with slight modification. The second one would be sufficient for low-end appliances whereas it may not suffice the high-end ones. So you have to choose the inverter depending on the type of the appliances you need back up for. What type of battery do you need? 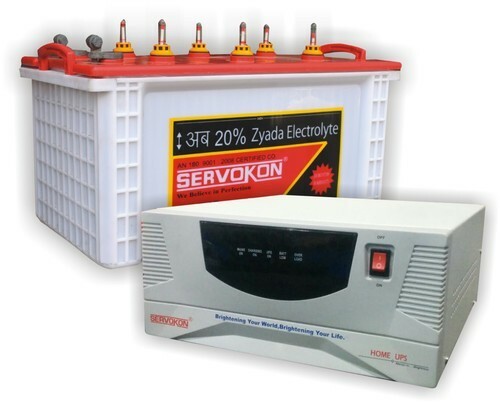 – The overall efficiency of a UPS greatly depends on the type of the battery used in it. Maintenance free batteries, flat plate batteries, and tubular batteries are the three most common type of batteries available. Tubular batteries have better durability compared to the others, and hence they are costlier as well. Choose The Best Inverter And Install It Rightly! Analyse the above-listed points carefully and explore the various type of inverters available in the market. Compare the prices, quality and make sure they are perfect for your requirement and suit your budget at the same time. Buy your inverter only from a trustworthy dealer so that you get the best worth for your money. The installation of an inverter is also very important to ensure its efficient operation. So do not overlook the installation part, get it done by trained technicians only!